Tod Swormstedt is the founder and executive director of the American Sign Museum, featured this month on Antiques Roadshow. He talked about the museum’s origins, his family business, and how he figured out what he wanted to be when he grew up. In college in Florida I had a part-time job at the St. Petersburg Times. Although I graduated with a degree in English literature, I had no intention of working for my family in their magazine publishing business. I wanted to be a writer. After helping out when they were short of people who could write a basic sentence, my Dad asked which of the publications I would consider working on—just to see if I might like it. I chose Signs of the Times because the sign industry attracted me. I liked the design aspects, the craftsmanship, the history, and the new developments in sign making. We were cleaning out a safe at the old location in the mid-1990s and found a gold leaf sign painter’s sample kit with a letter to my grandfather that said something like: “I am getting up in years and none of my family has an interest. I don’t know what to do with my salesman samples, but I know they’re in good hands with Signs of the Times magazine.” That discovery came to mind in the late 1990s when I saw a growing interest in preserving the tradition of sign painting and I was figuring out what I really wanted to do when I grew up. The museum board looked at national sites, including Los Angeles, Memphis, and St. Louis. By 2000, encouraged by the city officials in Las Vegas, we began warehousing signs. When we realized that we had to open somewhere to prove that it was not a whacked-out dream, Cincinnati seemed like a good central location. The call from the Antiques Roadshow people came out of the blue. They said that they had heard neat things about the American Sign Museum. Next thing I know we have a message that they would like to come by on Friday. When appraiser Leila Dunbar arrived, I found out that her father had been a vendor of antique signs. I was immediately comfortable and since I had a tour to lead, I left her to do the taping. Swormstedt got involved with The Letterheads in the early 1980s, a group of sign-makers that met informally and studied old-style sign-making techniques. In the 1980s Signs of the Times floated the idea of a national sign museum, but no formal plans were launched. “Our archives included numerous offers for donations of antique and mid-century modern signs,” says Swormstedt. Many of them were still available two decades later. The first American Sign Museum opened in 4,500 square feet at Essex Studios. 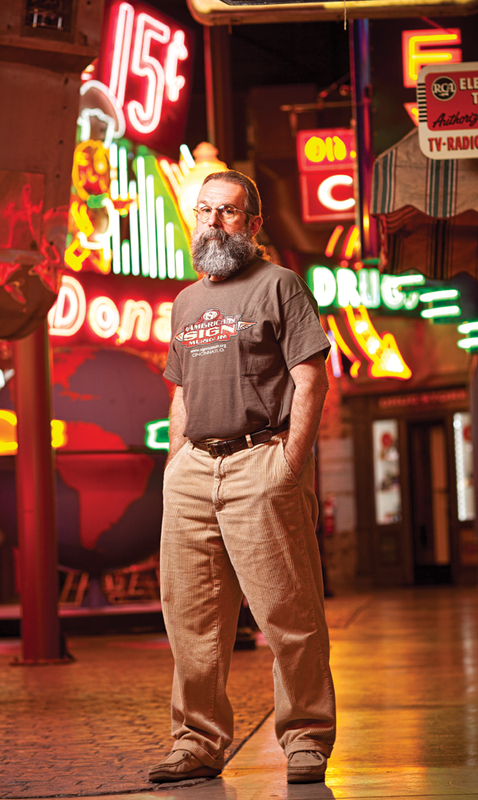 In 2012, Swormstedt moved the American Sign Museum to a 19,000-square-foot complex north of downtown. Center last July, will air on WCET at 8 p.m. on April 1, 8, and 15. Originally published in the April 2013 issue.